He expects parliament to support a number of important bills. 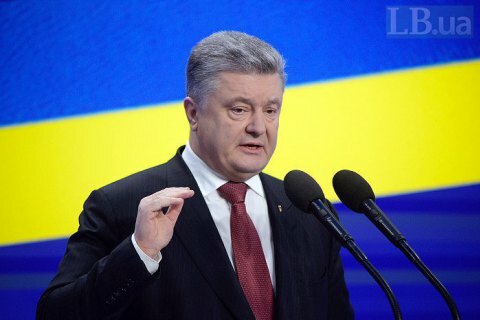 President Petro Poroshenko has said that he is not planning to disband the Ukrainian parliament. "I am fully satisfied with the pace displayed at the last [parliamentary] session, with cooperation between the president, the coalition and the government. Many reforms were adopted. I believe that parliament is capable of demonstrating shifts with regard to the law on national security, the law on the National Financial Investigation Bureau, the law on the Anticorruption Court, and with regard to carrying out parliamentary functions concerning personnel appointments, […] concerning the approval of acting ministers in order to strengthen the government, to support government initiatives and to make decisions on the reform programme… If parliament adopts all of these [bills], there is nothing to talk about," he said at a news conference in Kyiv on 28 February. However, he added that he can use his constitutional right if parliament turns unfit for service: "If instead of doing of all this parliament gets busy with elections, it will make them happen." During the agenda-setting council on 26 February, the deputy head of the People's Will group, MP Stepan Ivakhiv, raised the issue of snap parliamentary elections. Speaker Andriy Parubiy flatly objected, describing the idea as an external scenario. Rumours about President Poroshenko considering a dissolution of parliament and an early parliamentary election has been circulating since the beginning of the year. The law bans holding an early parliament election a year before the next scheduled one, thus the deadline for calling a snap election is the autumn of 2018.